With a 4-1 record against the ace machine, Ivo Karlovic, defending champion Mardy Fish knew he had his work cut out for him. 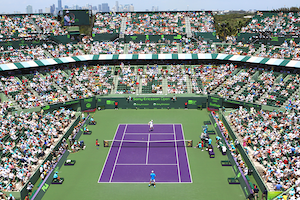 In the semifinals of the Delray Beach International Tennis Championships, the chilly weather possibly affecting a chronic left knee injury, a ribcage issue and Karlovic firing backhand winners all conspired to halt Fish. 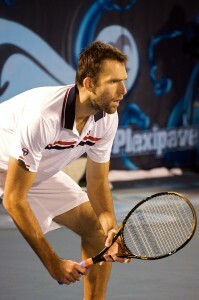 Karlovic prevailed 6-2, 6-3 to earn his first final spot in two years. Following an initial comfortable service game, with a Karlovic forehand up the line winner, Fish went down break point. When Fish failed on a pass attempt, Karlovic took a 3-1 advantage. With Fish unable to chip away at Karlovic’s serve, the latter jumped to a 5-2 lead. At that point, Fish called the trainer and received attention to his abdominal area. With Fish’s serve lacking zip and going predominately to the forehand, Karlovic elicited a couple of errors from his counterpart and wiped out two game points. Then, with a backhand down the line winner, Karlovic arrived at set point. Ivo cashed in when Mardy was unsuccessful with the down the line pass. Initially, after getting off on the right foot in the second set, Fish stumbled again. Subsequent to a forehand up the line winner by Karlovic erasing a game point, Fish saw a backhand down the line blaze by to set up a second break point for the Croat. As Fish’s forehand flew long, his racket also went airborne as he realized in handing Karlovic the break, he was probably done down 1-3. With three back to back love games, Karlovic punched his ticket into Sunday’s final against Ernests Gulbis. This should be a fascinating encounter since it will be these two’s first meeting. In doubles, Mike and Bob Bryan will defend their ITC title after defeating Taylor Dent and Ryan Harrison 6-7,7-5,10-4 in the semifinals. After a multitude of chances with either break or deciding point on Harrison’s serve in the first set, the Bryan brothers could not get the 17 year old to blink. Instead, cool under pressure in the tiebreaker, Harrison made a stellar return which allowed Dent to finish with a backhand up the line winner for their first mini-break. But, later, a miss hit return by Mike led to a Dent error wiping out the advantage. Still, after holding serve to get a second set point, Harrison connected with a monster forehand return giving his team the first set. Up 40-0 in the opening game of the second set, a couple of winners by their rivals and a backhand volley mistake by Mike resulted in a deciding point for the Bryans. However, with Harrison losing control of a forehand, the Bryans banked the game. Thereafter, each side continued to serve well until the twelfth game whereby a thumping return by Bob elicited a miscue from Harrison for set point. Bob crushed a return winner on the next point to wrap up the set. In the super tiebreaker, team Bryan seized control. By forcing errors from their opponents, Mike and Bob sprinted to a 8-1 lead. Dent and Harrison narrowed the gap to 9-4. However, with a topspin lob winner, Bob put a period on the match and sealed their 600th career victory. In tomorrow’s final, the Bryan brothers will battle the unseeded pair of Phillip Marx and Igor Zelenay. The latter beat James Blake and Robert Kendrick in the quarters, then advanced to the finals due to a walkover.